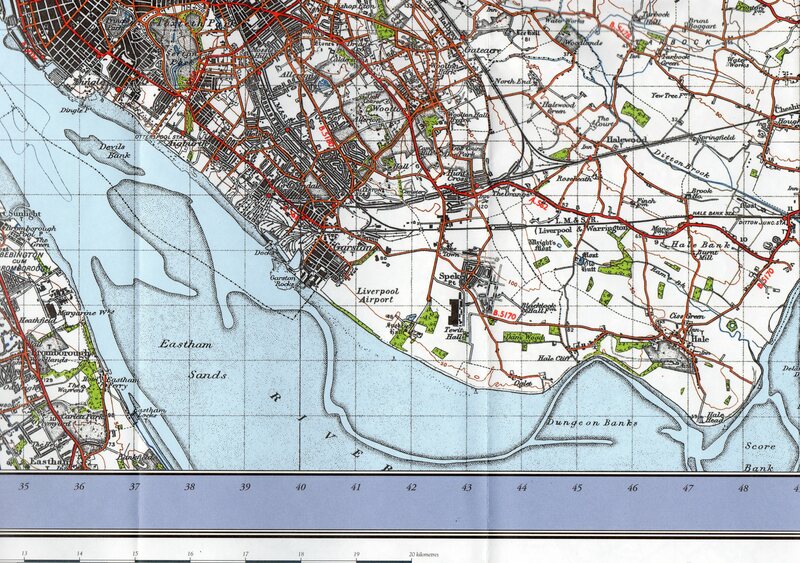 The above is a detail from the 1947 OS Map 108. It shows quite clearly the ‘white spaces’ beyond the Liverpool boundary, speaces that were soon to fill up with new housing estates to take people from the inner city. Similar white speaces exist at the same time around the tiny town of Kirkby. Over the next month or so we’ll be looking at some aspects of the transitory time as countryside became built over. In particular, individual memories of childhood, of playing in rural surroundings, of visits to the riverside, of nature and adventure. We’ll look at Paul McCartney’s memories of growing up in Speke when it was being built and Western Avenue ended in fields and mud; we’ll look at his recall of happy visits to Oglet, an almost idyllic escape from urban life. Even today, a walk from Garston past Speke Hall – along the Mersey Coastal Path – reveals the remains of farming activity, second world war defences, and the Dungeon, a major salt waorks. See Mike Royden’s excellent piece on Oglet and the Dungeon, and the importance of salt to the rise of Liverpool’s economy. I like the little drawings of Sefton Park and Princes Park. I forget that they are that close together. There’s a little island in the lake in Princes Park that I used to play on as a kid and it seemed huge when I was that age, from about 9-13 y/o. I went there last year to have a look at it and upon inspection of the Island it just looked so…..well……small. I kind of regretted going to look at it at first but then as I walked along it I remembered the things it used to be to me and how all that was just an imagining, so I imagined it again and it felt good.